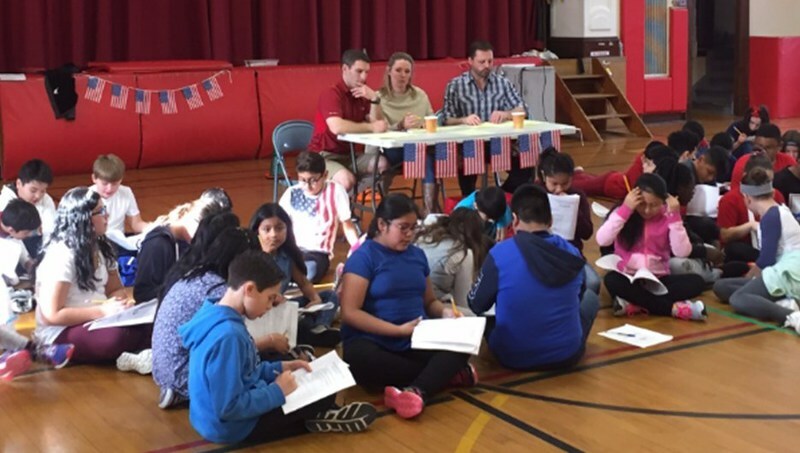 Teaching artist Danielle Marie Fusco recently turned a unit on US government into a lively kinesthetic learning experience for Grade 5 students in Patchogue-Medford. The classroom teachers invited Ms. Fusco to guide the students in the arts-integrated project, which involved interpreting how the government works through dance. 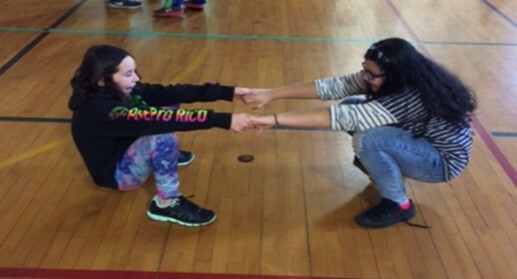 During her arts residency, Ms. Fusco reviewed the different aspects of government and introduced dance movements that could be used to choreography the culminating “Dance the Government” event. For each of her residency’s five sessions, Ms. Fusco focused on specific facets of both government and dance. For example, in Session One, the teaching artist and students discussed the Articles of the Confederation. They paid particular attention to the conflict surrounding the document’s creation. Students were given workbooks (below) to use throughout the residency. 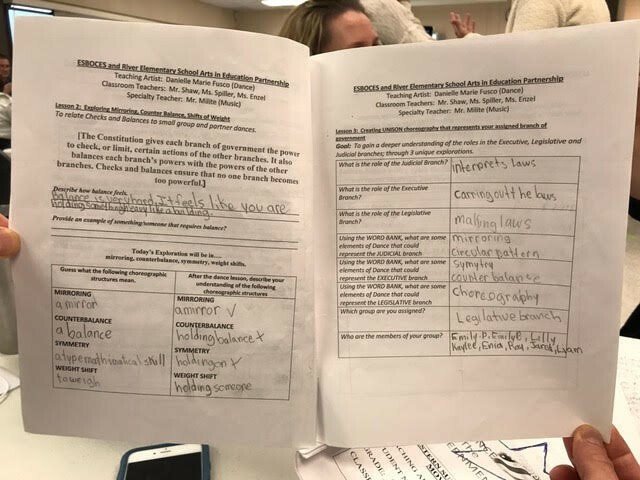 “The workbooks helped the students make academic connections between government and dance,” explained Ms. Fusco. “It’s important for the kids to realize what they know about their world. The greater their understanding is, the stronger their art will be!” The workbooks tackled both the government and dance, including dance and stage direction terminology. After their discussion of Articles of the Confederation, Ms. Fusco introduced dance movements that might be used to express conflict. She showed video clips of a flash mob that had gone badly as well as a raucous Black Friday shopping scene. She asked the students to describe the conflict in the video clips in their workbooks. She inquired: “How does a person feel when he or she experiences conflict?” The students answered that they get scared. 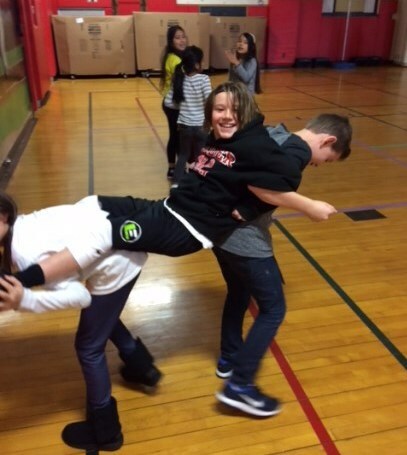 Ms. Fusco reinforced their response by demonstrating stiff, stationary movements, which she said were axial movements. Next, she asked: “How does someone’s body move when he or she experiences conflict?” The student said a person might run, hop or skip. The teaching artist called those actions locomotive movements. She told the students to put down their workbooks and join her in a circle (below), where they practiced both axial and locomotive movements. Ms. Fusco introduced Rondo, a pattern used in poetry and music, in Session Four. Using Rondo, she and the students explored how the Judicial, Legislative, and Executive Branches operate. 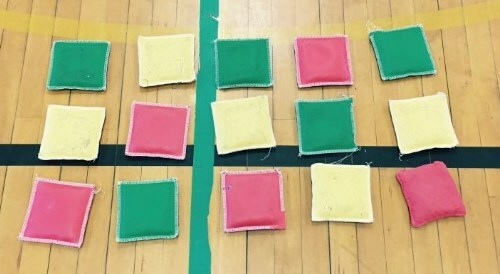 The teaching artist used colored bean bags (below) to teach how the pattern of RONDO is applied in dance as well as how it can be used to represent the government’s checks and balances. The grade level’s classroom teachers served as the competition’s judges (below). The educators chose the group that best interpreted government in dance, while offering positive feedback to both groups. And finally...some of the project's wonderful feedback (below).